With 10 months to go before the congressional elections, the divisions reflected in results from recent national elections – by race and ethnicity, age and education – are evident in preferences on the generic ballot for Congress. Currently, the Democratic Party has a wide advantage in voting intentions: Among registered voters, 53% say they will vote for or lean toward the Democratic Party’s candidate for Congress in their district, compared with 39% who say they would vote for or lean toward the Republican Party’s candidate. Majorities of those under 30 (66%) and 30 to 49 (58%) favor the Democrat in their district. By contrast, those 50 and older are divided: About as many favor the Republican candidate (48%) as the Democratic candidate (46%). While white registered voters are divided in their preferences (49% favor the Republican candidate while 43% favor the Democrat), large majorities of black (88%) and Hispanic (67%) registered voters support the Democratic candidate. There also are stark divides across levels of educational attainment. A substantial majority (70%) of registered voters with a postgraduate degree say they would vote for or lean toward the Democratic candidate. A smaller majority (58%) of those with a college degree say the same. By contrast, those with a high school degree or less education are more divided (45% support the Democratic candidate, 48% the Republican candidate). Among whites, the education divide is even wider. By roughly two-to-one, a majority of whites with a postgraduate degree say they support the Democratic candidate over the Republican candidate (65% vs. 29%). Among whites with a high school degree or less education, the reverse is true: 65% support the Republican candidate, compared with just about a quarter (28%) who prefer the Democratic candidate. As 2018 begins, a majority of registered voters say they are looking forward to the congressional midterm elections this November. Today, about two-thirds (63%) are looking forward to the midterms; at this point in 2014 and 2010, smaller majorities (58% and 55%, respectively) said they were looking forward to the midterm elections. Reflecting partisan control in Washington, interest in congressional elections among partisans has shifted since the past two midterms. Today, Democrats and Democratic leaners (69%) are more likely than Republicans and Republican leaners (58%) to say they are looking forward to the congressional elections. By contrast, in the midterm years during Barack Obama’s presidency, Republicans expressed more enthusiasm than Democrats. This pattern can be seen along ideological lines as well. 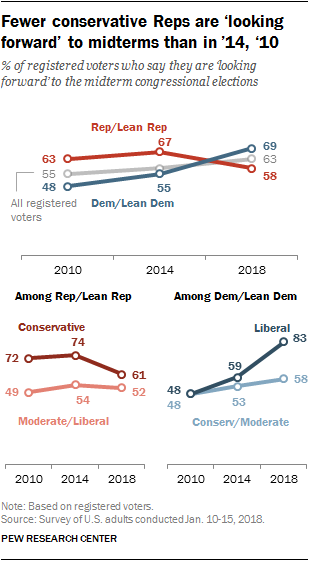 Roughly eight-in-ten liberal Democrats (83%) say they are looking forward to the midterm elections, up significantly from 59% in 2014 and 48% in 2010. In 2014 and 2010, conservative Republicans were the most likely to express enthusiasm, with roughly three-quarters indicating they were looking forward to the midterms. Today, a smaller majority (61%) of conservative Republicans say they are looking forward to the November elections. In the upcoming midterm elections, a majority of registered voters see Donald Trump as a factor in their vote: A third think of their vote as a vote against Trump, while 21% say they think of their vote as a vote for Trump. Fewer than half (42%) say Trump will not be much of a factor in their voting decision. At a similar point in his presidency, Barack Obama was less of a factor in people’s voting decisions. In February 2010, 24% of voters saw their vote as being for Obama, 20% against him and 51% said he was not a factor. 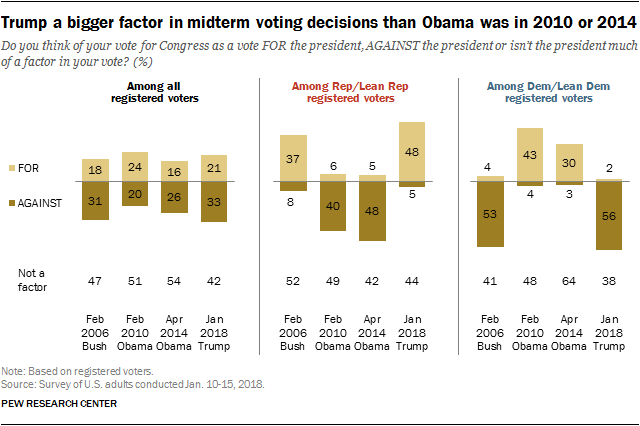 And in April 2014, when more voters saw their vote as being against Obama than for him (26% to 16%), more than half (54%) said he was not a factor. Today, most Democratic voters see their midterm vote as being against the president. A 56% majority of Democrats and Democratic-leaning voters think of their vote for Congress as a vote against Trump; 2% say it’s a vote for the president, and another 38% don’t factor Trump in either way. About as many Democrats today think of their vote as one against the president as said this in 2006 about George W. Bush (53%). Nearly half of Republicans and Republican-leaning voters (48%) say they consider their vote for Congress as a vote for Donald Trump; 5% say it’s a vote against the president, and 44% say Trump isn’t much of a factor. More GOP voters today say their vote is in support of Trump than said this in February 2006 (37%), during Bush’s second term. Conservative Republicans, in particular, strongly consider their vote as support for Trump: 58% say their vote for Congress is a vote for the president. 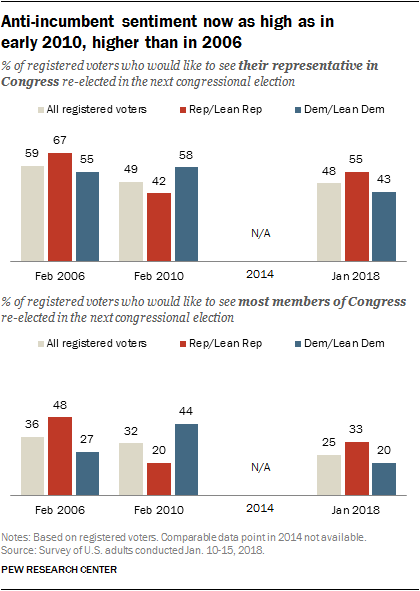 In early 2006, fewer than half of conservative Republicans (44%) said their congressional vote was a vote for Bush. While the president is a bigger factor in people’s voting decisions than in prior midterms, so too is the issue of which party controls Congress. A majority of registered voters (63%) say the issue of which party controls Congress factors into their vote this year. That is higher than the shares who said this in April 2014 (53%), February 2010 (48%) and April 2006 (56%). With Donald Trump in the White House, party control of Congress is somewhat more of a factor this year for Democratic voters (68%) than for Republican voters (62%). 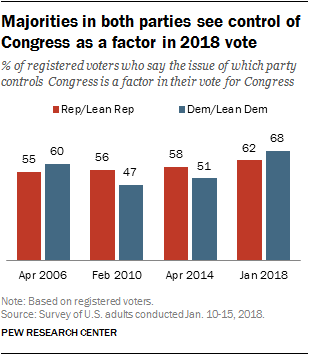 In 2014 and 2010, during Obama’s presidency, Republicans were more likely than Democrats to say party control of Congress would be a factor in their votes. Anti-incumbent sentiment, which has been substantial in recent midterm elections, remains high today. Currently, only about half of registered voters (48%) say they would like to see their representative in Congress re-elected in this year’s midterm election. Just a quarter say they would like to see most members of Congress re-elected this fall. While the Republican Party has majorities in the House and Senate, Republican voters are generally less supportive of incumbents than they were in early 2006, when they also had congressional majorities. Currently, 55% of Republican voters say they would like to see their own representative re-elected (67% said this in early 2006) and 33% want to see most members re-elected (48% in 2006). Democrats are even less likely than Republicans to express support for congressional incumbents. Just 43% want their own members of Congress re-elected, while 20% say they would like to see most lawmakers re-elected.